South Rome Redevelopment officials broke ground Monday for a scattered-site affordable housing development that has been in the planning stages for more than four years. “I’m just glad to still be around and see it come to fruition,” said Sam Moss, former chairman of the South Rome Redevelopment Corp. The grass was crackling underfoot and officials had to put some extra oomph into turning shovels of dirt from the sun-baked soil at the former Anna K. Davie Elementary School site on Nixon Avenue. Now renamed Burrell Square to honor the late Rome educator Sam Burrell, the site will be home to 17 duplex buildings and 34 residential units, designed to look like single-family homes. Two other sites are in the mix. Two apartment buildings, with a total of 27 units, will be built on South Broad Street where the old McCall Hospital was once located. The complex will be known as McCall Place. 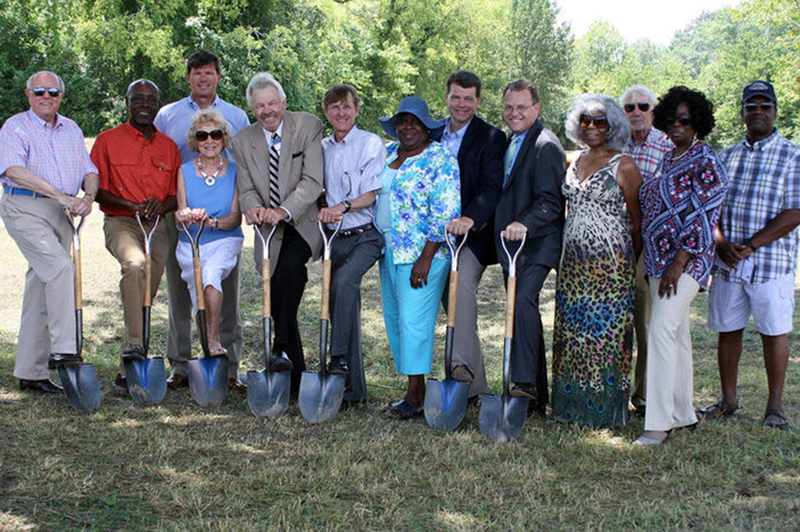 Two more, with a total of 23 units, are going to constructed on Etowah Terrace and will be known as Etowah Bend. Silt fencing is in place at all three sites in preparation for grading. Cochran said the work would start at Etowah Bend, and then McCall Place, followed by Burrell Square. Cochran said the duplexes at Burrell Square will be finished first, by August 2017. The McCall Place and Etowah Bend buildings are slated for completion by the end of 2017. The budget for the project is $13.8 million, with much of the construction costs financed by the sale of federal and state tax credits that were issued for the development.